If you are looking for something bright and cheerful to counteract a cold dark winter day, head over to George Washington University for Bingata! Only in Okinawa at the Textile Museum (through January 30, 2017) in Washington, DC. The Textile Museum show draws on a colorful textile tradition unique to Japan’s southernmost prefecture. An independent kingdom until 1873, Okinawa (Ryukyu) had its own trading partners, language, culture, and textiles. Among the region’s unique traditions was bingata, a printing technique noted for its bright colors and intricate patterns. Bingata is a resist dying process where each color is applied separately by sealing the dye out of the rest of the material. Resist dying techniques are found around the world in various forms (most commonly using wax or ties to create patterns in the fabric), and bingata (which uses rice paste) probably developed when Ryukyu’s 14th century traders came home with intricately dyed textiles from India, China, and Indonesia. 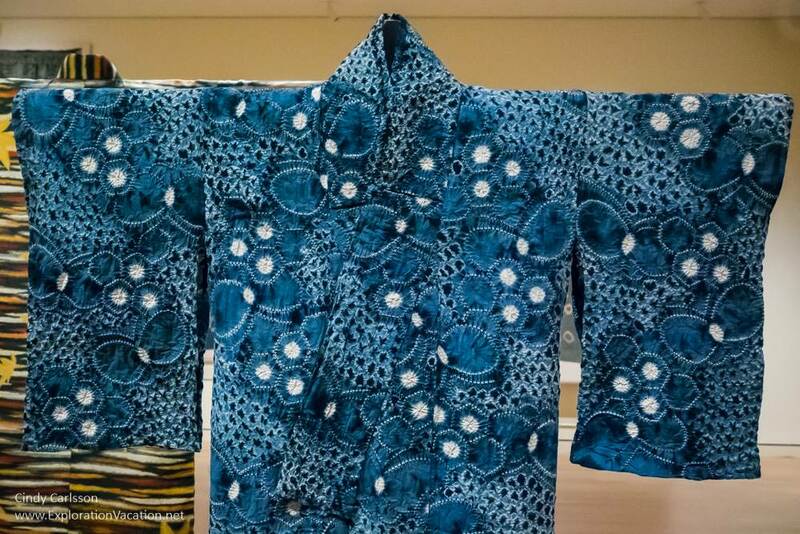 The Textile Museum’s bingata show opens with examples of fabrics created using resist dying processes, including a stunning 20th century shiboru kimono. Like other resist techniques, bingata is dyed one color at time, often using stencils to control color placement. A complicated pattern might have as many as 18 layers of color, making this an exacting process. This form of resist dying reached its peak under Japanese rule in the 18th and 19th centuries when elaborate patterns were in high demand to clothe members of royal families and wealthy individuals. With a decline in demand as the 20th century approached, bingata production had already gone into decline by the time the Battle of Okinawa destroyed the remaining shops. Fortunately, a former bingata artist restarted the tradition after the war, beginning with postcards that became popular souvenirs for the occupying American soldiers. Bingata is still produced on Okinawa, and the exhibit includes a few contemporary pieces, including a recent war-themed kimono. With bingata, everything looks cheerful. The Textile Museum is now housed on the campus of George Washington University (near the Foggy Bottom Metro station), where it shares space with the Albert H. Small Washingtoniana Collection as part of the George Washington University Museum. The museum is closed on Tuesdays and University holidays. A small donation is requested to visit the two museums. The Bingata! Show closes at the end of January 2017. This post is linked to the Image-in-ing weekly link-up.